I just saw this on Perez- he thinks it's fake- but it could be one of the "wardrobe/character" shots that they take in the begining of production. It screams Italy scene to me. (I don't think Perez has read the books. )It could very well be nothing- but i like it. Yumm-ooo!!!!!!! good god thats a nice pic, haha. and yeah I'm thinking Italy too. Wow Kristen is going to royally screw that scene up! Hot, yes. Yessity yes yes. His head is too small for his body! And why put a turkey in the background? omg I didnt even realise the turkey!!! HAHAHA what the hell is that?! I don't know. Nice body, but he looks like he has AIDS face. 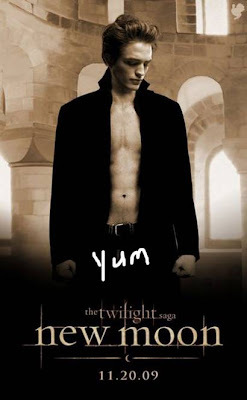 alright, who wrote "yum" on the picture? Even if this is fake, they should hire the person who made it to make the rest of the real posters! It's really good. it came from Perez Hilton, right? He usually writes on his pics. It just looks a little funny. And it's not the offical posters that they'll be selling. They didn't write the date that the movie's coming out on the Twilight posters, did they? And wouldn't they have "Edward" written on there somewhere?